By Dr. Rebecca Patterson, D.C. It wasn’t too long ago that we thought that ADHD was limited to a condition of childhood. Fortunately, we now know that ADHD manifests itself throughout our life and doesn’t ‘turn off’ when we turn 18. It stands to reason that we can benefit from care throughout our life. We shouldn’t stop treating ADHD when a child becomes an adult. We think of ADHD in terms of a neuro-behavioural, developmental disorder. And indeed, it is. However, within this definition, the physical symptoms of ADHD get minimized and neglected. In fact, each stage of development is associated with particular physical symptoms that can be painful, frustrating and can hamper one’s overall sense of well-being. Chiropractic care is unique in its ability to gently treat both the musculoskeletal system and the nervous system. It is proven to be safe for infants, children and adults. Many of the above conditions have been shown to respond positively to chiropractic care. To learn more about how chiropractic can help ADHD symptoms, call Natural Care Clinic. As many of you know, B12 has the ability to dramatically change development. Research into methylcobalamin (methyl-B12) is being conducted by Dr. Jill James of the Arkansas Children’s Research Institute and is funded by the National Institute of Health. This ground breaking research has identified that 90% of children with autism have methylation defects. Methylation is the process that supports development, detoxification and production of important brain chemicals (serotonin, dopamine, GABA etc). B12 sends “fuel” to a starving brain. Dr. Richard Deth, a neuropharmacologist at the University of Northeastern in Chicago has identified that children with AD/HD do not bring methyl-B12 inside their cells at the same rate as children without a diagnosis. This means that not only will B12 help children with ASD, it is also a front line treatment for children with AD/HD. The power of B12 is in its ability to repair biochemical defects. MB12 works with the folic acid cycle to make all the cells in the body and to support production of brain chemicals that are responsible for development. It is essential that anyone receiving B12 as a treatment is also taking a form of folic acid. The most activated, and effective form, is called 5-METHYLTETRAHYDROFOLATE or 5-MTHF. It is important to remember that the folic acid cycle must be able to “spin” as quickly as the methylation cycle to maximize development. If B12 is the only methylation support provided, the folic acid “wheel” will slow the methylation “wheel” which decreases the long term effectiveness of B12. Another key factor in B12 treatment success is dosage. Children begin the B12 regiment using a dose based on weight. If a child responds, the goal is to increase the amount of B12 to a tolerable level (i.e. a level that does not create adverse effects). The methylation cycle is responsible for development. If B12 increases the rate of your child’s development, the goal is to “spin” the methylation wheel as fast and as effectively as possible to allow for maximal results. Once a B12 dose has been established, it should be re-evaluated every 3-6 months. At this point, other methylation supports are added to continue to repair the methylation and folic acid cycles as well as the detoxification and neurotransmitter production pathways that depend on B12. What are the benefits of MB12 treatment? MB12 is a treatment, not a cure. However, many children using MB12 combined with other biomedical and non-biomedical therapies make incredible developmental gains and in a small percentage of children, have had their ASD label removed. Parents must understand that the maximum results from MB12 therapy occur over years, not months, not weeks. Initial results will be obvious within the first 4-12 week period and continue with the help of the proper dosage and activated folic acid. The Natural Care Clinic is a located on Appleby Line in Burlington. We specialize in naturopathy and massage therapy. 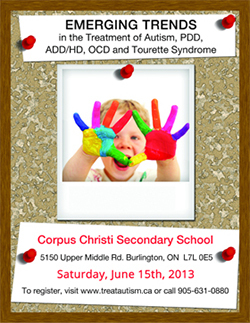 Click here to Register Now for tickets to the 4th Annual conference on Biomedical Treatment of Autism, PDD, AD/HD, OCD and Tourette's.